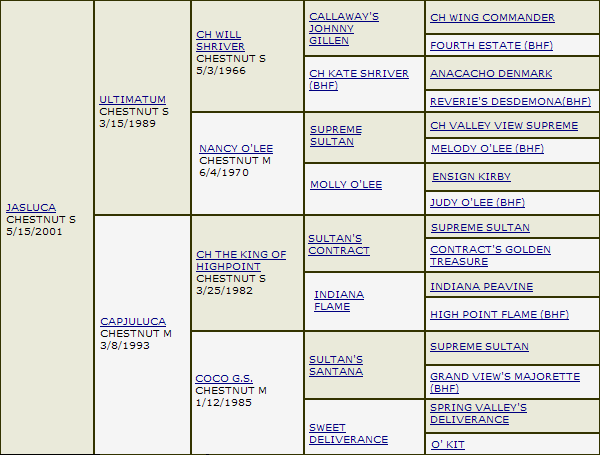 Jasluca, "Jazz", is a dark chestnut, flaxen-maned 2001 saddlebred stallion. He stands just at 16.1 hands and has competed in multiple areas, from saddleseat as a very young horse to show jumping. He is a true testament to the versatility of the American saddlebred, approaching each new endeavor with just as much enthusiasm as his rider. He has great bone, a short back and a strong, uphill topline, all of which can be a nice balance to the conformation of many saddlebred mares. 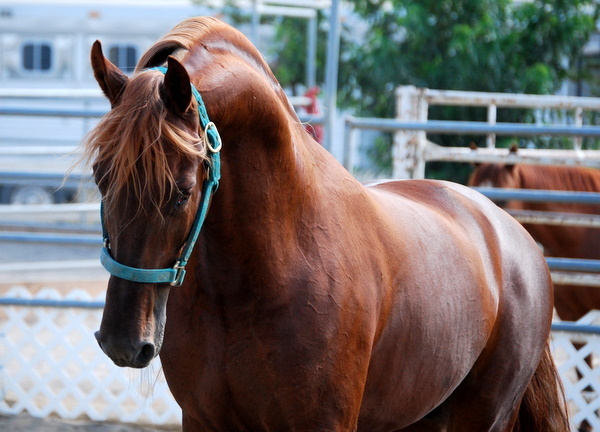 His elastic trot, powerful canter and high trainability are all qualities that you can see in his babies. On top of his athleticism, he passes his kind temperment on to his offspring, and he is both easy to handle and extremely sensible for a stallion. 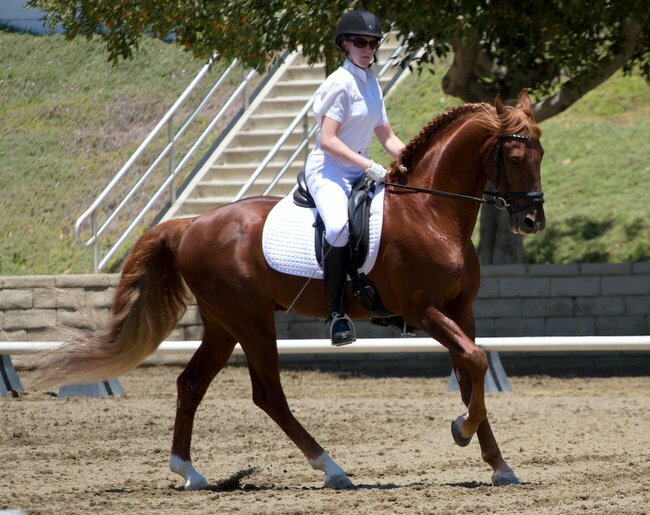 Jazz has recently begun dressage training and is finding his true strength in this sport. The same free shoulder that led to a lofty park trot when he was showing saddleseat as a youngster gives him lot of reach and impressive adjustibility in the dressage arena. He also has a lot of natural suspension to his trot and a canter that is stronger and more expressive than that of many of the warmbloods he competes against. He is a fast learner and scored in the mid-60s at training level in his first year of showing. He is beginning to school second level movements and we are sure that he will continue to perform just as strongly in the future. Jazz's offspring could do well in any of the sporthorses disciplines - in small part due to "wow" looks and presence, but mostly on their athletic ability. 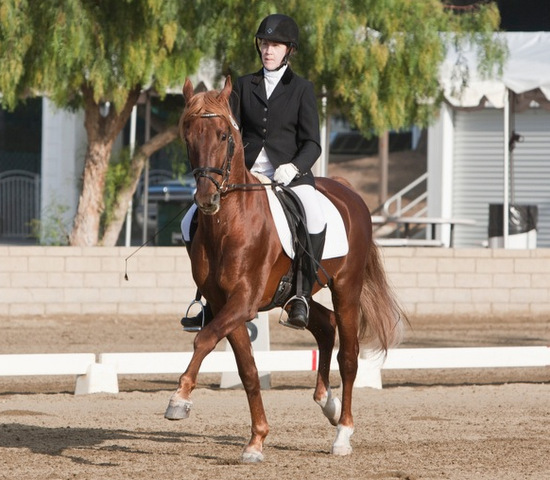 He currently has one son on the ground named Dr. Gene, who is also competing and excelling in dressage. You can learn more about him on Dr. Gene's page. For more questions specifically about Jazz, you can e-mail his owner.